Rawhide Dog Chews - What's Good & What's Not! Although there are strong feelings both for and against rawhide dog chews, all puppy and dog owners know that chewing is something Fido just HAS to do! But did you know that rawhide can be fun and safe if chosen properly and used sensibly? Although rawhide has had a lot of negative press, and there can be dangers if you choose inferior or inappropriate products, or don't supervise your pet while he's playing with it, it still has tons of play-value and can keep a puppy or dog healthy and entertained for hours at a time. Rawhide is made from the inner layer of a cow's hide. It is cleaned and dried before being cut, rolled, shaped or pressed into one of many different shapes or forms. Rawhide produced in the USA is not subjected to any chemical treatments that could be bad for your puppy's health. That is not necessarily true of rawhide that is processed in other countries where there have been reports of toxins such as arsenic and chrome being used. If possible I always recommend buying 'Made in the USA' rawhide products from a reputable manufacturer. The rawhide dog chews I've featured in the right hand column all fit that bill ! The chews featured below all fit that bill! The main danger with rawhide dog chews is when Fido is given a chew that he's able to rip large chunks off (if he's small breed puppy even little pieces can be problematic). If Fido swallows these pieces they'll be softened by his stomach enzymes and expand. Once that happens there's a possibility that one, or more, pieces could get stuck in his digestive system and create a blockage which requires surgery. There are different varieties of rawhide dog chews available - rolled, compressed, granulated or cut. Each type varies in texture, appearance and hardness and comes in several different sizes. Some are flavored, colored or bleached. What type you choose depends on whether you have a small, dainty chewer; a mid-sized averagely enthusiastic chewer; or a large, aggressive chewer. To help your pup or dog enjoy his rawhide safely, it's important to match the right type of chew with his chewing style. 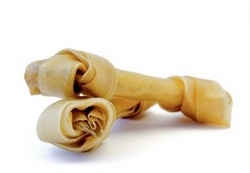 The softest rawhide dog chews are the ones made from granulated rawhide (also called extruded rawhide). 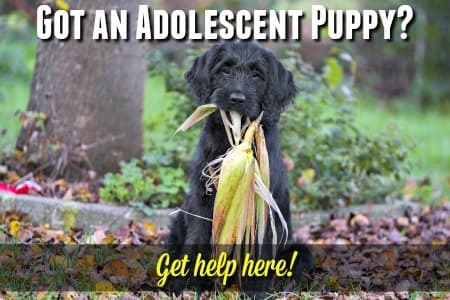 This variety crumbles fairly easily and should only be given to light chewers or puppies, and only in small amounts as it's usually eaten pretty quickly. This variety is usually cut into strips or rolled. it's then made into bone shapes, usually with a knot at each end. The flat knotted bones are a bit softer than the rolled, knotted ones. Only choose bones that are made from one (or max. two) sheets of thick rawhide. Ones made from multiple thin sheets will be ripped up too easily. These are usually suitable for average chewers. Pay special attention to the 'knot' it needs to be an integral part of the rawhide sheet making up the 'bone'. If it's an additional piece, knotted and then attached to the body, it's too easy for your pup to chew it right off. This can be very dangerous if he tries to swallow them whole (which often happens as they're difficult to hold and chew and usually fit fairly easily in a dog's mouth). Smaller, flat pieces cut from rawhide sheets. For more safety and a longer-lasting play session, choose the thickest ones you can find. These rawhide dog chews are easily softened and are often the right size for swallowing whole. Not suitable for large puppies, dogs or active or aggressive chewers. This is usually made up of several layers of rawhide which is compressed into a shape (often a bone but without the knots). This results in a very dense, hard rawhide chew that lasts a long time. These may not come to mind when you're thinking about rawhide, but they're very similar and give great, all-natural and long-lasting chewing fun for most dogs. There's literally something for everyone! If you choose the right type of rawhide dog chew and match it to Fido's chewing style, you've made a good start. It's very important to supervise your puppy or dog, whenever they are chewing on rawhide. That way if he should succeed in chewing a large piece off her beloved bone you will be there to stop him from swallowing it. 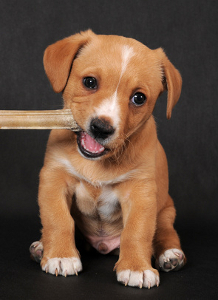 Each time he finishes chewing and playing with his rawhide, you should examine it for any large, softened pieces. These should be cut off. When the chew gets small enough to fit in his mouth, take it away and replace it with a new one. The compressed rawhide is generally left unflavored, but several other kinds come with the option of added flavor basting. 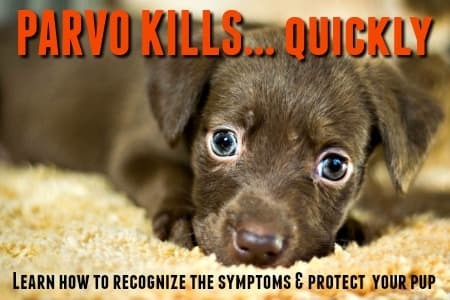 Your pup will probably enjoy it, but the basting is usually highly colored (artificial coloring, especially red can cause allergies) and gets pretty sticky once your little ones tongue has licked it greedily. The basting then has a tendency to get all over both your pet and your floor, carpet, his bed (or your bed) etc. Not what everyone wants to see! And of course, you want to wonder about what's IN that coloring/flavoring. Many chemicals, some of them potentially harmful, are used by some manufacturers. And don't think that a snowy-white, un-flavored rawhide is perfectly free of addititives though! Often bleaches and other chemicals are used to remove the natural, pale-tan coloring from rawhide and to render it 'sanitized white' - these are not safe either. Rawhide dog chews can provide a good opportunity for your puppy to indulge her desire to chew, and if you choose the right variety and match it to her chewing style, as well as giving adequate supervision it can be a safe and enjoyable toy. But of course, whether or not to allow Fifi to have rawhide chews/toys is a personal decision, and only you can decide what you're comfortable with. If you decide to say "yes" to rawhide follow the above guidelines. If you choose not to go that route there are plenty of other options out there. You can get tips on picking the best toys for a puppy who's teething on my Puppy Teething Toys page (and also get access to pages of the best and safest choices). And check out my Indestructible Dog Toys page to see a great selection of some of the toughest dog toys on the market! Flat Knot Bone, 13" - 14"